The Chairman of the UN Commission of Inquiry on Syria, Mr Paulo Pinheiro, became visible emotional at the UN Press Conference held March 01,17 when asked to elaborate on the potential implication of some of the great powers in war crimes committed in Syria. He had just introduced the Commission’s Aleppo report, an inquiry into human rights violations in the Aleppo Governorate between July 21, 2016 and December 22, 2016. And its findings where almost the usual stuff for all those who follow the Syrian civil war since the very beginning : air strikes on schools, bakeries and markets, water stations, hospitals, use of chemical weapons, attacks on humanitarian convoys and installations, starvation as weapon of war …..all grave breaches of International Humanitarian Law. The difference this time ? The scale and the intensity of the attacks : unseen so far. Mr Pinheiro refused to elaborate : “This is not new ! In all our reports I have said the same !”, he said. His obvious frustration is shared by the whole human rights movement. Every year the same war crimes, the same reports, and the same appeals to the international community and the UN Security Council to finally make those horrendous crimes stop and the perpetrators accountable. To no avail. And this frustration doesn’t date since yesterday. It was already in 2014 that Lakhdar Brahimi, in his last official interview as UN Envoy to Syria, in a rare moment gave up his role as diplomat, and declared that the international community was complicit to what happened in Syria through its acts, but also through its omissions. Wait a minute ! Complicit through omission ? Omission, the failure to act knowing that this failure would cause the crime to happen, is a punishable crime in ordinary criminal law ! And as a matter of fact, it also is in International Humanitarian Law, as constituted among others by the Geneva Conventions. So could it be that the omissions of Western leaders were punishable criminal acts ? Let’s investigate. Five conditions have to be met in order to be able to speak of a crime of omission according to International Humanitarian Law. We will focus our investigation on the European countries, because contrary to the US, they signed and ratified all Geneva Conventions and accept the jurisdiction of the International Criminal Court. The conclusions though may also apply to US leaders. The Geneva Conventions require that States do all in their power to ensure that International Humanitarian Law is respected. The failure of international organizations like the United Nations or the European Union to act, does not exempt the individual countries from these obligations. States have several peaceful tools at their disposal to fulfill the duty “to do all in their power”: (i) diplomatic protest, (ii) imposing sanctions (iii) in case of grave breaches of the Geneva Conventions : vest universal jurisdiction in their courts… The Western leaders had absolutely the ability to use those tools. International observers agree that Assad’s war machine was essentially kept afloat by Putin’s financial and military support. Knowing that Europe alone finances through its oil and gas trade with Russia, 35 % of the Russian federal budget, it is not exaggerated to postulate that Assad’s war machine was essentially fueled with European money. This gives Europe definitely an elevated degree of concrete influence. 4. The accused failed to act, (…)with awareness (…) that the consequences would occur : check ! Though many of the documented war crimes are considered grave breaches, none of the member states of the European Union lived up to their obligations. They did not order their courts to investigate and they only imposed sanctions on the weakest party to the conflict, the Assad regime, and spared completely those arming, financing and participating in those crimes : Russia and Iran. European leaders did this in full “awareness“ of the consequences. Since the conflict is lasting for six years, they were fully aware that the lack of timely and appropriate pressure would lead to the continuation of the atrocities. This became all too obvious from September 2015 onwards, when Putin decided to engage his army more. It heralded an unprecedented intensity in air bombardments and crimes against humanity committed in their wake, culminating in the worst period of the Syrian war, the assault on East-Aleppo as described in the Commission’s Aleppo report. All this leads us to the conclusion that European leaders, and eventually US-leaders, for reason of omission might be complicit to the genocidal massacre in Syria. And with every report that is published, the case against them becomes stronger. The irony of history now is that, since the European countries are the only parties to the conflict who fully signed and ratified the Geneva Conventions, their leaders might be the only ones to be trialled for those crimes. ‹ PreviousCould European leaders be guilty of crimes against humanity in Syria ? 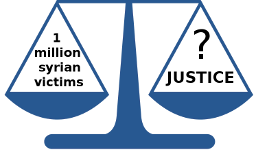 Next ›One Million Deaths in Syria ? Really ? Really !